Secret Wonderland Sera, with a Flower. - Welcome to The City of Desire. Secret Wonderland Sera, with a Flower. I hadn't wanted to buy another doll for at least three months, but I couldn't pass up on this cutie. She's completely sold out in most places. I don't think that's happened since Sweet Punk Girls! Koron. 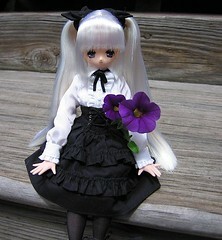 I love her royal purple eyes--Azone has had a problem with passing gray-eyed dolls as having purple eyes in their promo material. Not this time! Aside from the shoes and, obviously, the hairstyle, her outfit reminds me of Mitsuru in Persona 3.